Wow! Beautiful and comfortable rockers! Went together very easily. We paired them with sunbrella 19x19 cushions and coordinating pillows. Great quality all in all. The San Tropez Resin Wicker and Aluminum porch rocking chair from International Caravan is designed to add a distinct and traditional look to your outdoor living space. With its aluminum frame and resin weave, this chair is durable enough to withstand an outdoor environment, while still providing a comfortable place to sit. The vintage look of this resin rocker chair is perfect for any porch or patio. The San Tropez is a stylish and comfortable addition to any patio, porch or garden setting. Featuring a strong, durable aluminum frame and 4 mm resin wicker weave, this weather resistant chair is perfect in any setting. Place this rocker on your front porch to provide additional seating for unexpected guests, or use it on your deck as a place to sit while enjoying your morning coffee. Seats (1) person comfortably with a maximum seating weight capacity of 265 lbs. Dimensions 26.0 In. X 41.0 In. X 30.0 In. watch out for the rockers. This is a beautiful chair, very sturdy for my big beautiful body. So comfortable you don't need cushions. I do love this chair. I use it in a seating/reading area in my bedroom I had a problem with the rockers, spoke with Overstock they responded quickly. There is a specific way to attach the rockers. If I had unwrapped the chair I would have seen the instructions. The front has to be attached FIRST, then pull the rear legs into the hole. This takes some strength and I tried and tried. My friend Henry came and the rockers were on in about a minute. I purchased this online. The reviews were great so I took a chance. I love these rockers. I have a stone porch so wanted the rocker portion to be out of metal to prevent them from being chewed up. They came immediately. Assembly took 5 minutes. Product looks great. Size of seat made buying cushions easy. Great purchase, great price. Product received was not the product pictured. I received a completely different style chair than I ordered. The style that I received does not go with the style of my house and look out of place on my front porch. I am not happy with them. Resin covering aluminum means your rocker will withstand this dry desert weather and lack of humidity. Will not crack like wooden rockers do. I bought 2 of these (and the matching glass top table) for my front porch. They were delivered last week but I didn't get to put them out until today. Easy to add the rockers, solid well-made chair and oh so comfortable, even without the cushions (which I'm here to order today). They are darker than I thought they would be (ordered the pecan) but they are very rich looking and just finish my porch off so well. I am very happy with this purchase. 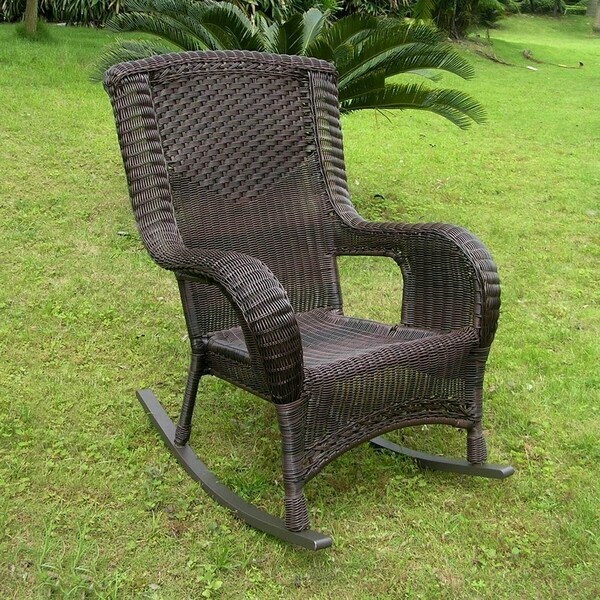 Comfortable San Tropez Resin Wicker rocker! The wife LOVES our I.C. San Tropez resin wicker rockers! They're comfortable, the visual profile is handsome and unique, but perfect for our porch area, because they've a sizable stature and not too small nor wimpy. Came with easy to follow instructions, and delivery was without damage. Couldn't be more satisfied! This chair is very sturdy, comfortable and very attractive. We bought 2 of the moss green for our patio. The only possible issue in the future is that water runs into the metal rocker rails. I found that tipping the chair forward allows the water to drain, but don't want to be concerned about doing this every time it rains to prevent corrosion. I bought 3 of these chairs for our front porch. They are very comfortable. I bought a cushion for the seat, but they are fine without one. The seat portion of this rocker is pretty good, but they tried to cut corners in the design of the rocker panels. The screws are too small and don't hold them on. We had to re-drill and replace them as every time the wind blew the panels would fall off. I ordered two of these chairs last September and within eight months they were falling apart. I put them in my garage during the winter months and on a covered porch during the summer and they still did not hold up. Contacted Overstock.com and they were only willing to give me *** for both chairs. Will never buy again from Overstock as they do not stand by their products! Very easy to assemble, comfortable. Nice size. Love these chairs. They sit on our covered front porch and held up nicely. 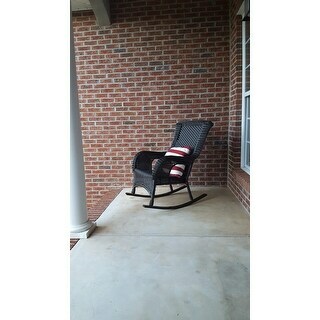 The one bottom rocker came broken but my handy husband fixed it. Other than that, I do love them. These were so easy to put together. I did it by myself and with my handy pink drill it only took 15 minutes. They look so pretty on my wrap around porch. These chairs are beautifully made but unfortunately the runners do not line up so one is now a chair instead of a rocker! Very very disappointing, especially for the price! Beautiful rockers. Only complaint is that the rubber strips on the bottom of the rockers start coming out and you have to push them back in. Also, very bumpy on a deck with slats. 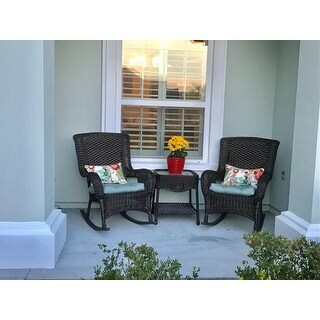 I purchased 2 rockers for my front balcony. they are in the sun all day and have held up very well. I suggest purchasing outdoor cushions to make the chairs much more comfortable. Love this wicker rocker. It arrived fully assembled except for the rockers which was easily added. It is very comfortable and well built. Purchased two of these rockers and am pleased with them. They are attractive, comfortable, and easy to put together. great Rocker..many compliment from house guests.. 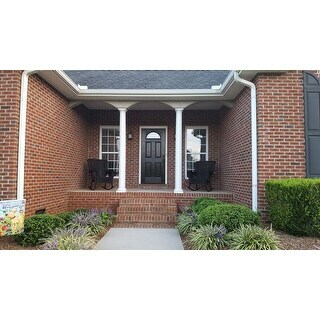 So glad to have purchased these beautiful rockers for our front porch. Well made and delivery was fast. The metal rockers were a little bit of a challenge to attach to the chairs by myself, but I finally got them on in a few minutes time. They rock smoothly and are comfortable chairs. Heavy duty chairs. Comfortable really glad purchased. I bought this chair to replace one that feel apart. The quality of this chair is much, much better. Rocks smoothly and is the perfect color for my porch. I love the high arms, that is one of the reasons I chose this chair. Most arms on rocking chairs are too low to rest your arms while reading, the arms on this chair are the perfect height. My cats really think that it's comfy, I have to fight them for it! "How high is the back of this chair? Can a normal person rest their head against it?" 29 inches from top of the back to the seat. I am 5'1" and with thick cushions it is still above the top of my head. "What are the inside seat dimensions?" Roughly 19 by 19 1/2 I purchased 19 x 19 cushions with the back side of the cushion being rounded ends. They fit perfect. I am very happy with this chair. "Does Overstock carry outdoor seat cushions that will fit these chairs?" I didn't see any cushions available. They are comfy enough without. I did purchase outdoor seat cushions. 19 x 19 with the back ends being rounded. They fit perfect. I am pretty sure I bought them through Overstock but if you can't find any there are a lot of other places. I got Sunbrella ones. Glad I did because although they are comfortable without they are also deep and I am 5'6" and would be sitting pretty low. "I have seen these international caravan san tropez chairs sold by several different companies. Does any one know if they are all the exact same chair? I can't tell because the measurements are slightly different on the site of each company that sells the chairs. I want to be certain I get a large chair and other companies have the measurements as slightly smaller. Maybe the chairs are being measured in different ways, or maybe the chairs are different." The model number for this chair is 4007-RKR. "The chair depth is listed as 30" Is this NOT including the rockers? Also in a previous question you said the seat height was 15" This is EXTREMELY low. Could this also be the measured seat height BEFORE being mounted on the rockers?" I own these. The seat height is 14 inches at the back and 18inches at the front without a cushion. The depth is 35 1/2 inches from front to back of the rockers. I love them. They are very comfortable. But I also added cushions. "what is the seat height of this chair--measured from the ground up to the seat?" The seat height is approximately 15 inches high. "Can I use this chair without the rockers installed?" No, you cannot use the chair without the rockers installed.